Mediacom Internet 60 features download speeds up to 60 Mbps ±. That's plenty of bandwidth for households with multiple users to share without lag! Surf the net, send email, upload files, stream movies or TV shows and play games online simultaneously. With Mediacom Internet 60, you can connect up to 4 devices at the same time! Internet 60 also features Online security with the Total Defense™ Internet Security Suite that can protect up to 5 of your PCs or other devices! Mediacom will arrive for your installation or service appointment within the scheduled time period, or you get a $20 credit toward your bill! Provide your own Docsis 3.0+ Modem and eliminate monthly modem rental fees! Add optional services to customize your Mediacom Internet 100 plan! Eliminate costly repair and service fees when you add the Home Wire Maintenance Plan to your Internet 60 bill. Cover all service related cable wiring in your home, including faulty or damaged cable wiring, fittings, equipment and outlets. Adding the Home Wire Maintenance Plan can reduce or even eliminate the cost of repairing cable wiring, Mediacom-owned devices, and other service related fittings in your home. Relax. 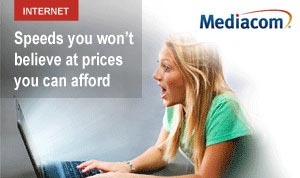 Mediacom's got you covered! Total Defense Internet Security Suite is offered FREE of charge to all Mediacom high-speed Internet subscribers. Protect up to 5 personal devices including PC, Mac Computers, Android Mobile Phones and Android Tablets from Online threats like viruses and spyware.